Sandblasting Machines Market size will surpass USD 570 million by 2025; according to a new research report by Global Market Insights, Inc. The automotive industry will witness growth at a healthy rate in the coming years. Portable sandblasting machines have a significant relevance in the automotive industry due to their ability to provide precise, better quality, and smoothly finished components. Sandblasting plays a major role in automobile production processes such as electroplating pre-treatment, finishing and polishing. With characteristics of automatic recovery, customized data collection, automated media flow control and reduced changeover and downtimes of machines that provide a more even and smooth finishing and desired texture. Further, sandblasting machines are also gaining huge demand from aftermarkets and local players for refurbishment of vintage cars, trolleys, railway carriage, tanks etc. Hence, these factors will augment the global sandblasting machine market demand. In marine & metalworking industry sandblasting finds application in, cleaning non-metal surfaces, removing mill scale, casting dirt, or heat treatment work piece, removing spots on the ceramic embryo surface and reinstating paint grain pattern. The demand for automated robotic sandblasting is majorly driven by the spurring demand from automated bridge maintenance systems which requires less manual operations. The global sandblasting machines market growth will come across a few hurdles due to Its disposal and debris management issues which leads to contamination of water bodies from toxic metals and materials present in anti-fouling paints. This pollution will pose an invariable and fatal effects to a broad spectrum of aquatic organisms. Dumping of paints, filter cartridges, grit material, etc. not only damages the ecosystem but also violates the WHS Regulations and Federal Water Pollution Control Act. These risks can be minimized by implementing several control measures like establishing exclusion zones around open air blasting activities, engineering controls and substitution. Wet blasting segment is likely to account for around USD 500 million by the end of forecast period. Water is generally used for wet sandblasting techniques and differs in finishing of the treated surface. Manual, semi-automatic, and automatic are the different control systems for the sandblasting machines market. Due to technological advancements and overall industrial development in North America and Europe, automatic and semi-automatic mechanisms find more applications in these regions. Sandblasting machines market is also segmented based on their tank capacity as above 3,000 Liters (L), 2,000 L to 3,000 L, 1,000 L to 2,000 L and less than 1,000 L. The lesser tank capacity equipment find maximum usage in construction and automotive industries as most of these lesser capacity equipment are movable and easy to use. Based on application, industrial segment will hold a major share in the entire industry. The equipment is used in various industrial purposes for refurbishment, surface treatment and cleaning purposes. Stationary and portable are the two product segments for the global sandblasting machines market. 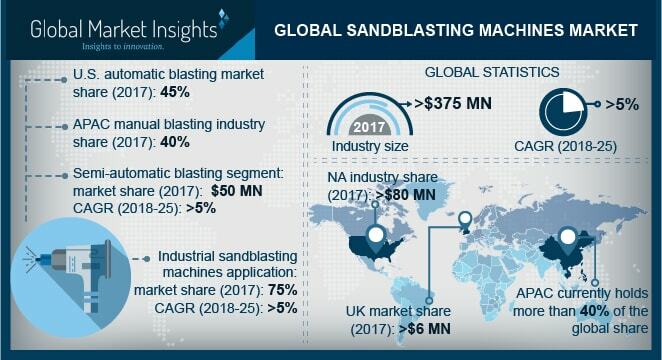 Considering end-user industries, construction, marine, automotive, petrochemicals, oil & gas are the major segments for the study of sandblasting machines market. Construction is the major segment and will hold the highest market share in the global sandblasting machines market followed by automotive. Oil & gas is one of the emerging segments and the product finds significant application in this industry. Considering region, Asia Pacific, led by China and India, will hold the maximum sandblasting machines market share. China will likely hold a market share of over 40% by the end of forecast period. Rising construction and automotive manufacturing in Asia Pacific is said to drive the regional sandblasting machines market in the coming years. Key sandblasting machines market players include Abrasive Blasting Service and Supplies, Graco Inc., ABShot Tecnics, Clemco industries, Manus Abrasive Systems, Torbo Engineering Keizers, Empire Abrasive Equipment Company, Axxiom Manufacturing, MHG Strahlanlagen, Airblast B.V., Paul Auer, Burwell Technologies, Kramer Industries, Gläsner Sandstrahl Maschinenbau, and Sintokogio, to name some.